Give Your Mouth a Spring Cleaning with Your Dentist in Columbia! What is it about the spring season that makes you want to clean, clean, clean? The hidden catalyst may never be known, but it’s great to use the motivation that you have for cleanliness to improve your oral health. Thus, your dentist in Columbia is weighing in to explain how you can enjoy healthier chops this spring with preventive care visits. The form of dentistry that focuses on empowering you through proactive activity is called preventive care. It includes the semi-annual visit to your dentist for cleanings and checkups, but why are these visits so important? Cleaning – The cleaning will remove the stubborn plaque and tartar that can buildup on your teeth and cause damage as they sink their acidic tentacles into your enamel. Checkup – When you go in for preventive care visits, both your hygienist and dentist will perform extensive examinations. One will be to identify oral care issues like cavities and gum disease, while the other will involve a full cancer screening and jaw assessment. The most applicable word, again, is ‘proactive.’ Therefore, the efforts you make to maintain these visits will allow you to avoid a host of problems that can spell havoc down the road. Why Go Every Six Months? Time Span – It spreads out the time period far enough that you don’t have to be overwhelmed with trying to weave any more space into your already busy schedule. 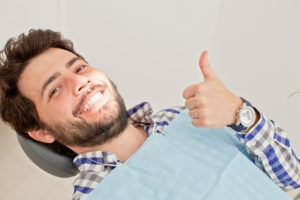 A Time for Change – The six-month period also allows you to implement any changes that your dentist recommends, and he or she will later be able to assess the success of your execution. Early Identification – Finally, this is a good period of time because most dental problems develop slowly. For example, a cavity can sometimes develop for years before you even notice it. But, if you develop one between visits, your dentist will be able to catch what your naked eye can’t, before it becomes a bigger problem. The next logical step is to reach out to your family dentist in Columbia to schedule your first visit and take a bold stance for your oral health. As a result, you’ll leave the office feeling healthier and empowered with the means to improve the wellness of your mouth, teeth and gums. To schedule your first appointment for some dental spring cleaning, reach out to your local professional today! A graduate of the University of Missouri-Kansas City School of Dentistry, Dr. Philip Batson enjoys every aspect of dentistry, from the interactions to seeing the smiles on his patients’ faces when they leave his office healthier. To stay abreast of the latest advancements in technology and techniques, Dr. Batson maintains membership with several professional organizations while providing excellent care at Health Smiles at Columbia. He can be reached for more information through his website. Comments Off on Give Your Mouth a Spring Cleaning with Your Dentist in Columbia!